The opening of the Tolles Parsons Center ushers in a NEW ERA for the Town of Wellesley, our Senior Residents, and the Staff and Volunteers of the Wellesley Council on Aging. The New Era Fund capital campaign has been established by the Friends of Wellesley Council on Aging to support the mission of the Council on Aging through a public/private partnership with the Town of Wellesley. The Friends of the Wellesley Council on Aging is a not-for-profit 501 (c) (3) charitable organization whose single focus is the financial support of the Council on Aging. Initiated in June of 2017, the donation and pledge goal for New Era Fund donations is $1.5 million over the next three (3) years. The New Era Fund is administered through the Foundation for MetroWest, a local organization that manages philanthropic initiatives for non-profit organizations in Wellesley and surrounding communities. Our seniors contribute their experience, knowledge, wisdom and commitment. Twenty-two percent of Wellesley’s residents are 60+ and that number is increasing. These older adults fill more than half of all volunteer positions on town committees. Their diversity enriches our community in so many ways. They are an essential part of the “fabric” of Wellesley. The mission of the Wellesley Council on Aging is to serve as the primary resource for residents over the age of 60: to empower individuals to reach their goals; to offer comprehensive programs, services, and assistance that optimize quality of life; and to enable meaningful connections and collaborations that inspire a spirit of community across the generations in our town. The Council on Aging has become a place where seniors can engage, connect, learn, and give back. From social gatherings and playing cards and pool, to senior transportation and fuel assistance, from educational outreach programs to exercise and lunches, the Council on Aging keeps our over-60 residents connected to Wellesley and to each other. 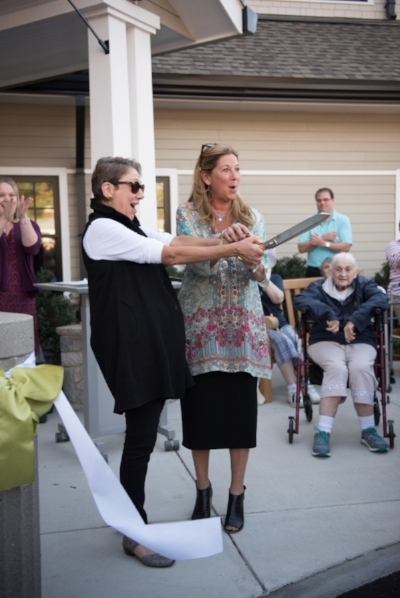 Harriet Warshaw and Terri Tsagaris cut the ceremonial ribbon at the Tolles Parsons Center (TPC) Grand Opening on October 22nd. 500 Washington Street. Along with many others, including the Board of Selectmen, the Permanent Building Committee, the Council on Aging, The New Era Fund, Terri and Harriet were instrumental in getting the center approved and built.